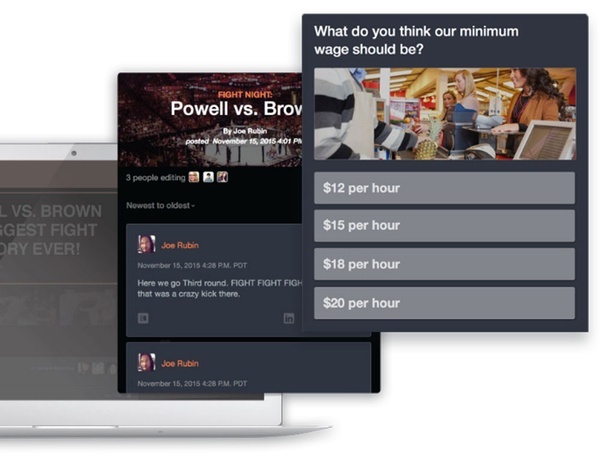 Livefyre’s Community Comments app gets your audience talking. Turn your site into the hub for your community. Get a powerful admin dashboard and user profiles for FREE. What is Livefyre Community Comments? The best becomes even better with Livefyre Community Comments. This platform for displaying free comments was designed from the ground-up for the social web, turning your blog into the hub of engagement. Livefyre Sidenotes inspires focused conversations by allowing users to engage directly with content — a quote, a paragraph, an image — anywhere on a page. By allowing readers to interact with and share your content as they read, Sidenotes lowers the barrier for engagement, increases time on site and boosts conversational civility. Note: For Community Comments, Sidenotes is only available on WordPress setups via the Livefyre Sidenotes plug-in. You love the comments and conversation going on about your blog posts, but they’re not all happening on your site. Your friends, family and loyal readers are also commenting on your post via Facebook and Twitter and you haven’t been able to capture that conversation. Until now. With Livefyre SocialSync, the conversation happening on Facebook and Twitter automatically syncs directly to your content, where it belongs. SocialSync comments can be replied to and interacted with just like any other comment, including being automatically posted back to Twitter or Facebook. Livefyre makes it simple for readers to join your community. Users have the option to sign in with multiple social networks to put a face to their name and comments. That way they can jump right in and join the conversation. No new log-in required. Sites can also use our guest commenting option to let their community comment without even creating an account. Getting your friends in on the conversation is as simple as typing the “@” sign. Easily invite Facebook and Twitter friends to join the conversation right from the comment box. Give your readers access to their entire social network to bring specific friends that would be interested in the conversation.! You have a great community with some smart ideas. Okay..maybe not all of these comments are Mensa quality, but a lot of them are interesting, funny or just a bit insightful. Let your community share those thoughts! With one click, users can easily share free comments with their friends on other social networks including Facebook, Twitter and LinkedIn. Empower your community to spread the best reactions to your content and bring more traffic to your site. There’s a reason teachers gave out gold stars in elementary school- who doesn’t love being told “job well done?” Let your community members recognize those users who elevate the conversation. Livefyre even shows the avatars of every user who’s liked a comment. Sometimes you just need to be bold. Free Comments includes new visualization tools like rich-text editing so that you can emphasize your point of view in flourishes of bold italics, or create a bulleted list to drive home your argument. Most of us look to our friends for their recommendations about a new restaurant, book, or a hair stylist who won’t give you the Dorothy Hamill wedge. It makes sense to discover new ideas, places and people through our community. Blogging is no different. Actually, one of the best parts about blogging is discovering new content and connections. LinkBack encourages community interaction by letting other Livefyre bloggers display a link to their latest post when they leave a comment. Most of us are more inclined to think about what we’re saying when speaking to a crowd. And no one likes to feel like they’re speaking to an empty room. Our Live Listener count lets readers know exactly how many people are on the current page or have followed the conversation, giving them more incentive to leave a thoughtful response. It encourages more participation and higher quality conversations. Community Comment Notifiers make it as simple as possible to follow conversations in real-time, even if you’re not looking at the comments! The widget shows you who is participating in the conversation and what they are saying as it happens, all without losing your place on the page – so you never have to miss out. Livefyre Community Comments enhances your media embedding options so that you can share photos from Flickr and Instagram, play videos from YouTube and Vimeo, flip-through slide decks on SlideShare, listen to songs from SoundCloud and Spotify, geek-out on animated gifs from Myspace, and even feature Wikipedia articles directly in the conversation stream.. Comment Editing allows users to edit their own free comments within a specific time frame so that they can fix their spelling mistakes without changing the context of the following comment stream. Site admins can make edits to all free comments as well. Livefyre realizes mistakes are inevitable. But your free comments shouldn’t have to show them..